John H. Bigelow ~ Photography: Two new ones and one I rediscovered. What a thrill this week to see these two Polyphemus Moths mating on the grass by our back door. I've never before had an opportunity to photograph one in the wild ...and then this! Through the summer I waited for these beautiful Yellow Swallowtail to show up and there were none. I called a couple of experts and discovered that they have seemed to almost disappear and for no known reason. They thought it might be a cycle and then, just when I gave up looking, God sent this ...and it was newly hatched! I thought I'd lost this photo of a neighbors cat. 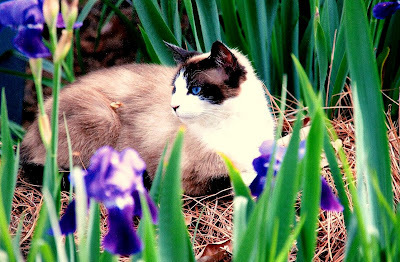 He/she has the most beautiful deep blue eyes that match the color of the Iris.